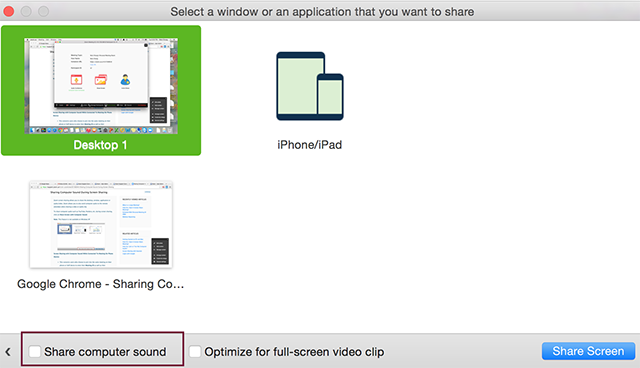 Zoom screen sharing allows you to share the desktop, window, application or audio/video. Zoom allows you to also send computer audio to the remote attendees when sharing a video or audio clip. Note: Computer sound cannot be shared while multiple screens are being shared. To share computer audio such as YouTube, Pandora, etc. during screen sharing, click on Share Computer Sound. This applies to users who join the meeting via both phone and computer to receive audio via the phone and video/screen sharing via computer and enter their Meeting ID and Participant ID to bind devices together. If this user checks Share Computer Sound on their computer, this will trigger the audio to channel through both their phone device as well their computer audio. To stop sending audio, simply click Stop Share at the top of your meeting screen or mute the speaker of your phone or the speaker of your PC or MAC.